If you were in any way troubled by the idea that a journalist would write a book based on exclusive sources, who are portrayed as uniquely responsible for a breakthrough in civil rights, and then those very lauded sources would throw book-parties and events to promote the book, you’re not alone. So to recap. A key and celebrated source in the book is placing bulk orders and holding a reception at City Hall for the tour, at Becker’s request. 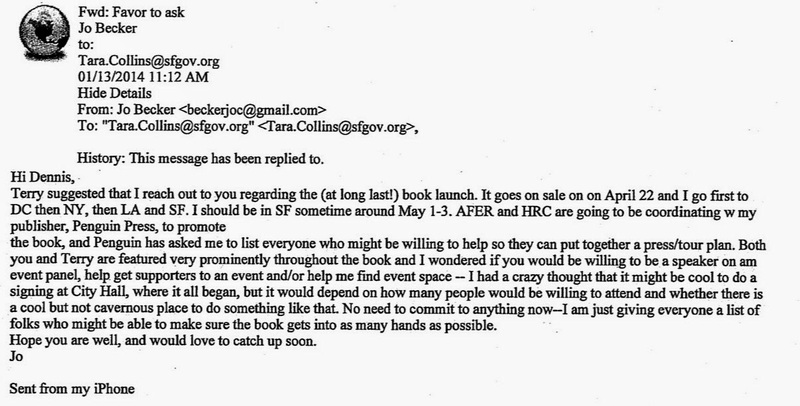 At the same time, HRC and AFER are integrally involved in the entire book tour. Both groups are part of Chad Griffin’s Hollywood-DC p.r. empire. So the main source and central hero for Becker’s book was integral to its publicity and promotion. While publicly writing that he disowned being called the Rosa Parks of the movement, Griffin has been actively and aggressively promoting the very book that says that in its first paragraph! And he was using HRC’s and AFER’s money – money donated to advance gay equality, not Griffin’s personal profile – to promote his own hagiography. If you want more evidence that this book was access journalism at its unethical worst, here it is. Quite why the NYT Public Editor has not weighed in on this is beyond me. It’s a disgrace. Previous Previous post: How Many Lives Will Obamacare Save?